Home > News & Press > Abilties Expo – What an Experience! Abilties Expo – What an Experience! On three occasions this year, I had the pleasure of attending the Abilities Expos. The first was in Edison, NJ, second was in Anaheim, CA and last month I was in Minn, MN. It is such a great expo for people with disabilites because it’s almost a “one stop shop”. 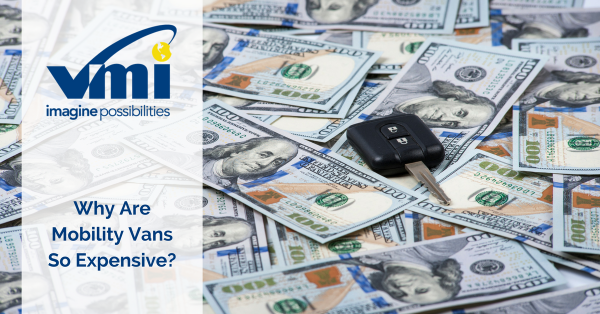 There are many Mobility Equipment Dealers and multiple manufacturers of mobility products, attorneys, local advocacy groups, and so much more, which is why these expos are so valuable. Some customers are focused on their mobility challenges and are confused when it comes to finding the ideal mobility solution to fit their needs. Mobility Equipment Dealers are the key to help customers focus on their real needs and matching those needs with the quality and features of available products. Today’s mobility customer is not just looking for a place to buy a wheelchair accessible van or lift, but for someone who will become part of their relationship, someone they can depend on to take care of them after the sale, someone who provides support service to make owning a mobility product hassle-free. Mobility Equipment Dealers are highly knowledgeable in understanding the nature of the customer’s disability. 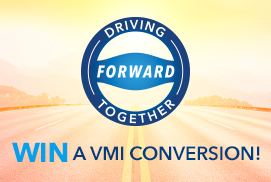 Dealers will sit down with the customer and ask questions related to their physical limitations and other key questions to determine the best mobility transportation solution for them. If a dealer is working with a person with a spinal cord injury, they will typically ask two questions: (1) What is the neurological level of the lesion (at what vertebrae did the lesion occur)? (2) What is the extent of the lesion (was it a complete lesion or incomplete lesion)? These questions help determine the appropriate level of physical ability of the end user. For example, if someone with a complete lesion above C7 will likely not have use of their triceps so if they are in a manual chair, they may not be able to get up the ramp. Mobility Equipment Dealers are educated on the most common diseases causing physical disabilities; Multiple Sclerosis (MS), Arterial Lateral Sclerosis (ALS), Muscular Dystrophy (MD), Cerebral Palsy (CP) and Polio / Post Polio. In addition to common diseases, MED’s also must be knowledgeable on age related disabilities; plain aches and pains to rheumatisms, emphysema and hip replacements. Once the Mobility Equipment Dealer assesses the customer’s disability they will ask many questions about their lifestyle like; What are you currently using to get around, How often will the van be used, Where will you go in your van, Who is the driver, Where is the van parked at home, Where is access at your house, What features are you looking for, What are you looking for as far as seating configurations, etc. These are all questions asked most likely over the phone or in the Mobility Equipment Dealer’s showroom so that MED can show you the products they feel will best fit your needs. The demonstration is probably the most important step in the sales process. 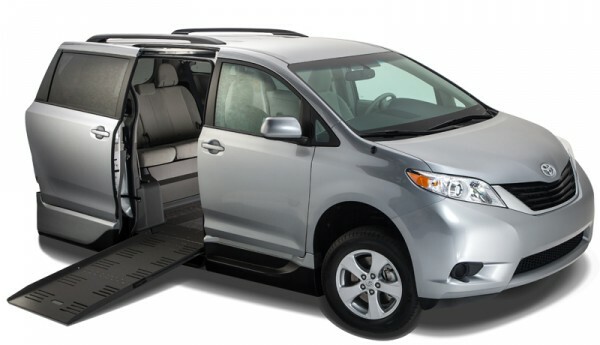 Each van has different dimensions, features and benefits. As a customer, you want to see, for example, how you can maneuver up the ramp. 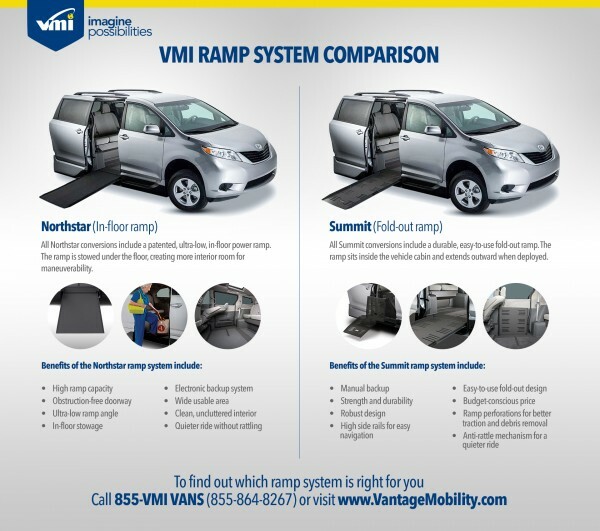 A one or two degree ramp angle can be the difference between the van being a perfect fit or unusable. The door opening height and width along with the head room inside the van are vital to the purchasing decision. Imagine spending $40,000-$65,000 on a modified van and not being able to get through the door? 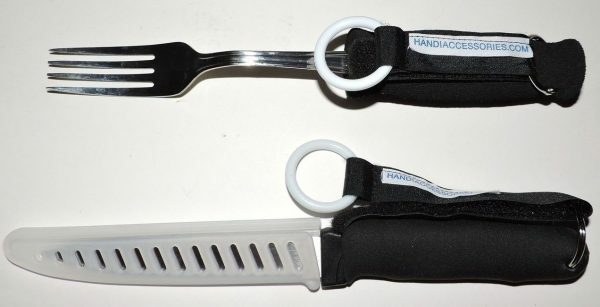 What type of restraint mechanism will you need and will you need hand controls? Go online and look for Ability Expos, http://www.abilitiesexpo.com/ or other open houses in your area. Take the time to find the best partner/Mobility Equipment Dealer that you feel most comfortable. Also take the time to learn about a variety of products and try out as many products as possible to ensure you are purchasing the mobility transportation solution that best fits you and your needs. Your independence awaits!